Smart Sensors Technical Reference Manual. Replacing Thermocouples: Room for Improvement? When replacing a failed thermocouple, one has a tremendous opportunity to improve the life, accuracy and effectiveness of the replacement, make one’s life easier, and possibly get a note from a process person on what a Smart decision he has made. In a recent survey we conducted, we found that 90% of replacement sensors are replaced with like sensors, (ie thermocouples replaced with thermocouples and RTDs with RTDs). So, you are going to be a maverick if you try to change the sensor type. Consequently, if the failed sensor is a thermocouple, you need to stick with it. Don’t replace it with an RTD, even though RTDs outnumber thermocouples by a wide margin in new installations or new temperature loops. This article deals with how you can improve on the sensor that you are replacing given that you will stay with the same sensor technology. Lets start with identifying the type/calibration of the thermocouple you have. If the vendor was Smart, he color coded the leads. This will enable you to determine the calibration or thermocouple type. The chart below provides the color codes for all standard and noble metal thermocouples. You may have noticed that I don’t like to take chances. That’s why I have such a good track record on locks. Along those lines, let’s assume that the thermocouple being replaced was in a well. This essentially eliminates three of your options. It would not be a good idea to change the sheath material, OD or length of the thermocouple. Chances are that the sheath was not the cause of failure. So if it ain’t broke; don’t fix it. You might have heard that, “the bigger the thermocouple the longer the life,” this might tempt you to opt for a larger OD. There is a good chance that your well has a .260 bore. If it does, and you increase your OD to 3/8”, you will get longer life primarily because the larger OD won’t fit into the existing bore. The replacement thermocouple will never be put into service giving it infinite life. Now for the exciting part. What can you do to improve the life and performance of the thermocouple? Catastrophic Failure - Oh yeah, we might get 2 or 3 seconds more of readings. Drift - Drift or aging is symptomatic of a material composition change caused by elements external to the thermocouple wire. 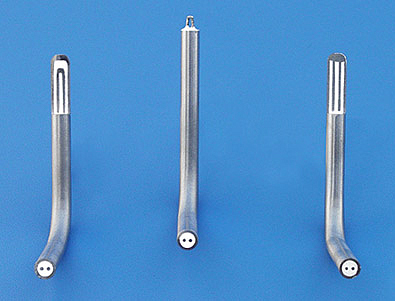 Carbide precipitation or impurities released from the inner wall of the sheath can be especially damaging to Type K /Chromel Alumel thermocouples. It is asking too much to expect that chemical composition changes won’t occur in all four wires given the confinement of the four wires and their shared environment. Once again Goldy will employ the, “I don’t take chances” rule. Let’s assume that the thermocouple is connected to a field or head-mounted transmitter. If it is, and the transmitter is programmable, then you will be able to change the calibration without incurring any added costs. If there is not a head-mounted transmitter, then stay with the existing calibration. It would be cost prohibitive to replace the thermocouple wire, and adding a transmitter will go beyond the scope of this article. 1. Does the existing calibration match the suggested operating range of the process? 2. Do I need stronger signal strength? 3. Can the accuracy be improved by changing calibrations? For example, Type T (Copper Constantan) is more accurate at lower temperatures than Types J or K.
4. Do I need the faster response that the thermocouple provides? 5. Do I need the ruggedness that the thermocouple provides? From left to right: ungrounded, exposed and grounded junctions. Since exposed junctions are rarely found on thermocouples that are housed in a thermowell, this leaves you with two choices--grounded and ungrounded If you have experienced the joys and pleasures of trouble shooting a ground loop fault, you have probably already replaced any grounded thermocouples with ungrounded thermocouples. So, if you have not guessed it yet, Goldy’s lock of the century is to replace any grounded thermocouple with one that has an ungrounded junction. Lets start with determining how to check for junction identity. Using an ohmmeter, check the resistance from either thermocouple wire to the sheath. If it is grounded, the meter will show direct continuity; and if it is ungrounded, there will be no continuity. Wait one minute Goldy. There has got to be a downside. Well, actually, there is. The ungrounded junction has a slower response time. The following chart provides response time characteristics per ASTM 470A. It measures a 63% response time change from ambient to boiling water. * Sensors not in thermowell or protection tubes. If your process can accept a slower response time, then ungrounded is the junction for you. It will not only make your life a little easier, it will make your sensors last longer. This could get you an atta boy from the bean counters. Hope this helps! And if it does, let me hear from you.